Lee Wichman is a Chicago-based actor. Chicago acting credits include: PSmith, Journalist, The Seven-Per-Cent Solution, Alice’s Adventures Under Ground, The Thin Man (City Lit Theater); An Enemy of the People, The Secret of the Old Queen (Stage Left Theatre); Laughter on the 23rd Floor (Open Eye Productions - Jeff Citation for Best Ensemble); Phantom (Clock Tower Theatre); Babes in Toyland (Theater at the Center); Autobahn (Awkward Pause Theatre); Nightmares & Nightcaps: The Stories of John Collier (Black Button Eyes Productions); Pericles (Blunt Objects Theatre); Catch Me If You Can (James Downing Theatre); a concert version of Fade Out - Fade In (Porchlight Music Theatre); and a concert version of My Fair Lady (About Face Theatre). Regional acting credits include: Moot (Milwaukee Repertory Theater) and Into the Woods (Blackfriars Theatre). Lee’s on-camera work includes the independent short film The Psycho of Happiness and the webisodes Dudes and The Up To No Goods. 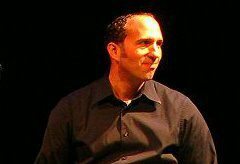 Additionally, Lee has worked as an assistant director at the Milwaukee Repertory Theater, the National Jewish Theater (Skokie, IL), and the Hangar Theatre (Ithaca, NY). Lee studied acting in Chicago at Act One Studios and The Actor’s Center and individually with Mary Ann Thebus. He studied on-camera techniques at The Green Room Studio and Vagabond School of the Arts and improvisation at iO Theater. Lee has had voice training at the Eastman School of Music and privately in Chicago. He worked privately with Beckie Menzie for vocal coaching. Originally from the East Coast, Lee moved to Chicago upon completion of his B.A. in English and Minor in Theater at the University of Rochester (which included a five-week intensive training at the Yale Summer Drama Program and a year abroad in London) and following theater internships in Ithaca, NY and Milwaukee, WI. Offstage, Lee maintains a private practice of psychotherapy in Chicago, working with individuals and couples, with a focus on treating fine and performing artists. More information can be viewed at www.leewichman.com. "Lee Wichman oozes corrupt, manipulative power as Scratch, the literally satanic movie producer." "A surprise guest star is the real star of this Sherlock Holmes pastiche...It’s Wichman’s Austrian Specialist that’s the show’s real star. His dry, understated wit is most welcome." "An unassuming appearance can hide the greatest surprises, and the most delightful performance in the production is that of Lee Wichman." "Lee Wichman is a lovely Freud, at once gentle and steely as he probes the secrets of the subconscious." "Broad-comedy broads and baggy-pants comedians Morgan McCabe, Edward Kuffert and Lee Wichman—as the Duchess, Mad Hatter, March Hare and numerous others—delight with slapstick and droll pun delivery." "Lee Wichman, playing the March Hare among other characters, steals his scenes with his quirky, crazy facial expressions and songs of soup." "Lee Wichman’s Mock Turtle was nothing short of brilliant."